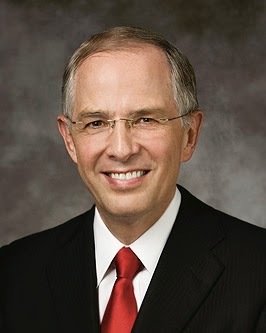 Elder Neil L. Andersen (b. August 9, 1951) served as a Seventy beginning in 1993, and was called to the Quorum of Twelve Apostles in 2009. 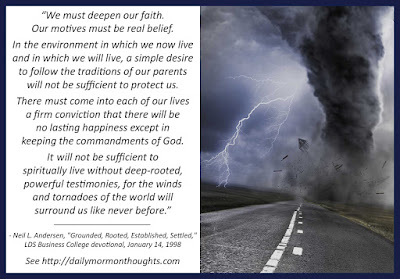 "To weather these storms in this environment the Lord has instructed us by His prophets that we must become grounded, rooted, established, and settled in spiritual things. (See Ephesians 3:17; 1 Peter 5:10; Colossians 1:23; 2:7) Christ himself speaking to His disciples said, 'Settle this in your hearts, that you will do the things which I shall teach and command you.' (JST Luke 14:28) Grounded, rooted, established and settled. "What does it mean to be grounded, rooted, established, and settled spiritually? It means to see 'things as they really are.' (See Jacob 4:13) It means having an eternal perspective, and realizing those things that will shape our lives over much more than the next five, ten, fifteen, or fifty years, but shape and mold our spirits eternally, for our spirits live forever. It is having a faith that is not a generalized feeling but reflects specific experience with interlocking principles. Being grounded and rooted means being able to look forward and backward from this life. A hundred years from now, how will my decisions affect me? A thousand years? A million years? The difficulties that are now mine, how meaningful will they be in a future state? "This perspective of seeing the spiritual all around us, seeing the purposes of life, does not come merely because we want to believe these things. 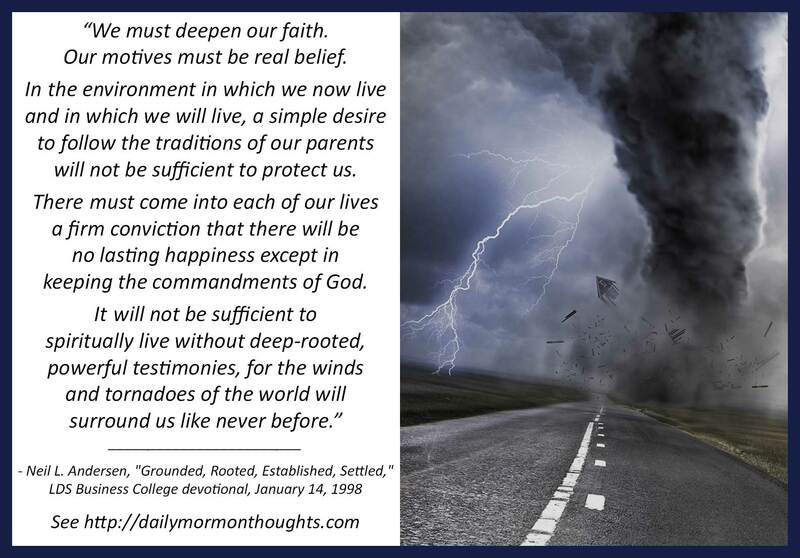 If we have not grounded and settled these things deep within the foundation of our soul, when the tornadoes come we will find ourselves carried away." I recently came across this talk by Elder Andersen, given when he was serving as a Seventy before his call to the Twelve. I loved his examples and analogies as he discussed the destructive power of tornadoes, and then considered the "spiritual tornadoes" of our time and the different but equally devastating destructive influence they can have if we are not prepared for their onslaught. Being grounded and settled happens "deep within the foundations of our soul." We would be wise to carefully examine our souls and consider how we can strengthen our spiritual moorings.